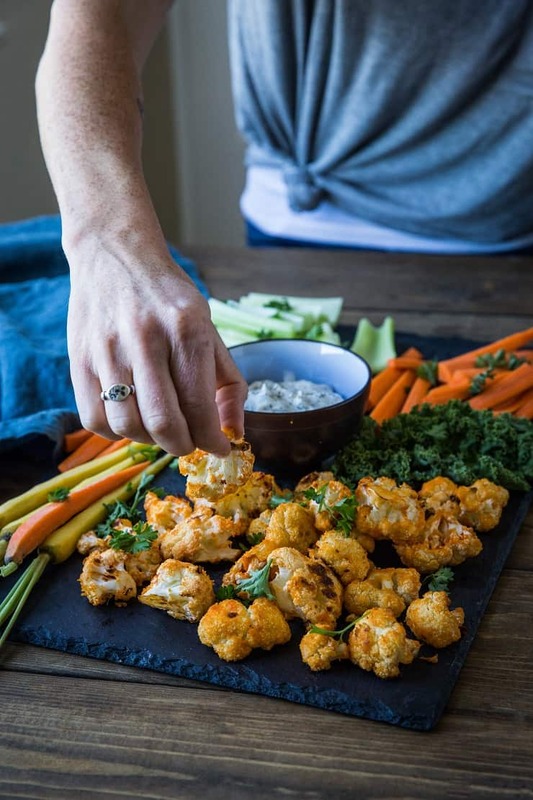 Crispy Buffalo Cauliflower Bites are perfect for serving friends and family at gatherings or during football season. It is a low-carb, keto, paleo, and whole30 friendly appetizer! This post includes instructions for making these bites in an air fryer or in the oven. Who here is a fan of all-things Buffalo? During football season, I always find myself yearning for buffalo-style eats even though I very rarely watch football. I am captain of team The Best Part About Football is the Food, no shame in it! I try to get my buffalo fix in the best possible way – with foods that are flavored buffalo-style, but aren’t deep fried or doused in less-than-stellar sauces or oils. Enter: the Buffalo Cauliflower Bite. 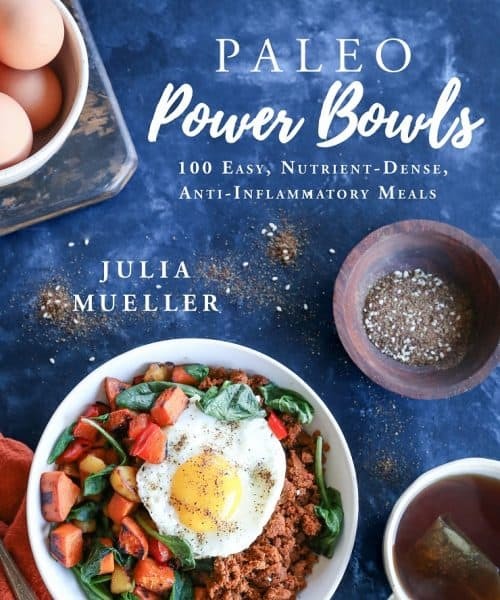 This recipe comes from Dr. Karen Lee’s new cookbook, Paleo Cooking With Your Air Fryer. 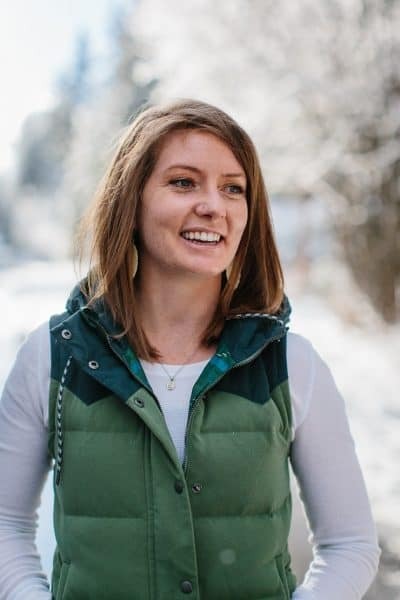 Karen is a Chiropractor with experience in holistic healthcare and also posts recipes and wellness information on her site, DrKarenSLee.com Karen always has my interested piqued with her creative recipes. 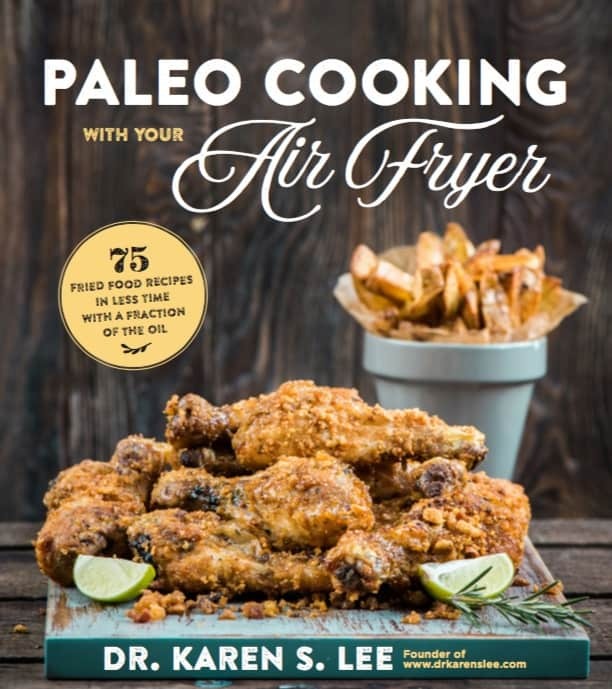 Karen’s book includes 80 paleo recipes that you make in your air fryer for a much healthier option to fried food. Now you can get your crispy-fry on without all the backlash! Do you own an Air Fryer? I hadn’t heard of the apparatus until recently, but the basic gist is the device yields crispy air-fried food that tastes like the real deal, but only requires a fraction of the oil. Those of you who are suckers for fried food or french fries but try to keep your diet healthy, this kitchen tool will be your new favorite belonging! For those of you who are new to the Air Fryer scene and aren’t quite on board yet, no worries: You can make this recipe (and all recipes in Karen’s book) in your oven, although they won’t turn out quite as crispy. I have included instructions below for baking these Buffalo Cauliflower Bites in your oven. 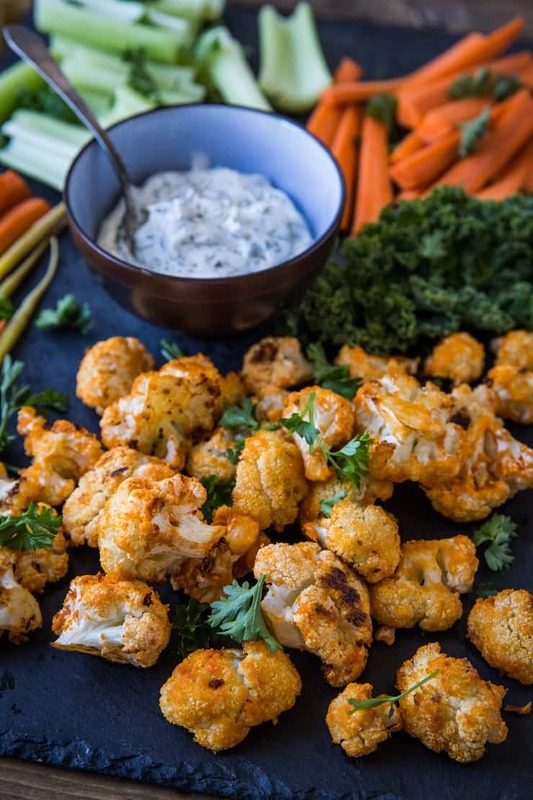 The process of making these buffalo cauliflower bites in the oven is a bit different from making it in an air fryer. The ingredient measurements will be a bit different – all you do is mix everything together in a mixing bowl, spread on a baking sheet, and bake. SIMPLE! Preheat your oven to 400 degrees. Toss the cauliflower florets with 2 tablespoons avocado oil, 1 Tbsp melted ghee (or butter), and 3 tablespoons Frank’s RedHot Sauce and 2 tablespoons cassava flour (or almond flour) until everything is well-combined. Bake for 30 to 40 minutes, or until the cauliflower reaches your desired level of crisp. 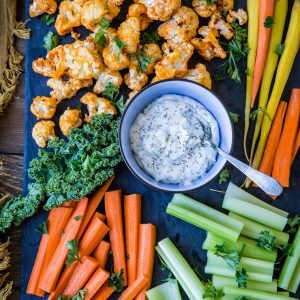 This recipe comes with a homemade ranch dip that is such a cinch to make and will blow your mind. You can serve it up to your guests alongside the buffalo cauli bites and fresh raw vegetables. Check out Karen’s book on Amazon and get your bite on! In a small bowl, make the ranch dressing by mixing all the ingredients, then refrigerate. When the timer goes off, transfer the florets to the mixing bowl and coat them well with sauce. Put the florets back in the basket and cook for 6 more minutes. Take them out when the timer goes off and add more Frank’s Hot Sauce if needed. Serve immediately with the ranch dressing. I swear if I had a bigger kitchen I’d buy an air fryer! I bet they make things so crispy and healthy to boot. But I can’t even justify getting an Instant Pot at this point. My cabinets are stuffed full! haha I’m with you – the food is always the most exciting part of watching football for me! 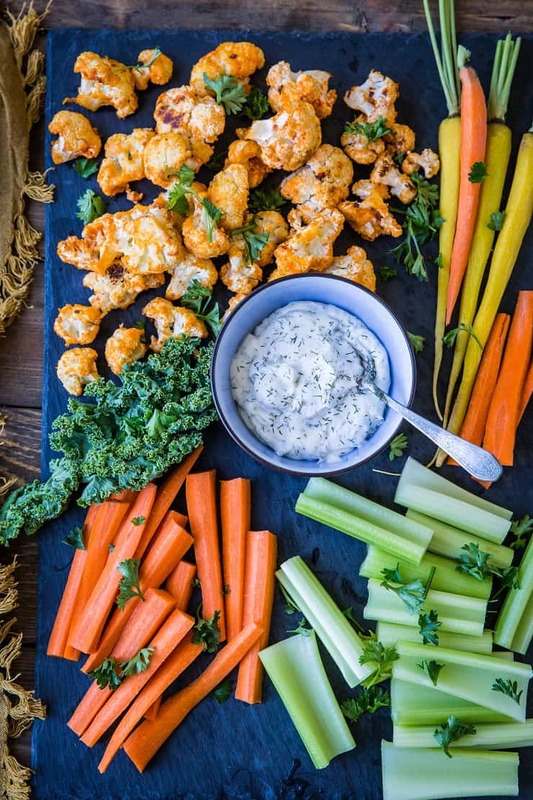 🙂 I am loving the sound of these buffalo cauliflower bites!